Seiko has given its iconic “Tuna” diver’s watch a radical new look with the Seiko Prospex Marinemaster “Gold Ocean” limited edition featuring a pink gold-coloured Cermet shroud. Seiko introduced a slew of new dive watches at Baselworld 2015 to mark the 50th anniversary of its first dive watch, including the top of the line Marinemaster Hi-Beat limited edition. The most striking additions in the new diver’s line-up is Prospex Marinemaster 1000m Cermet (ref. 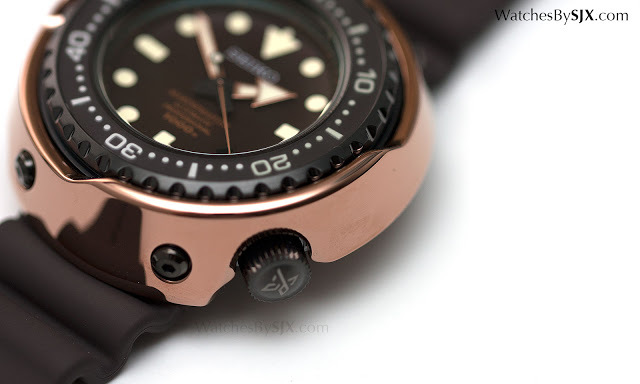 SBDX016), labelled the “Gold Ocean for its impractically glossy, pink gold ceramic and metal composite shroud. 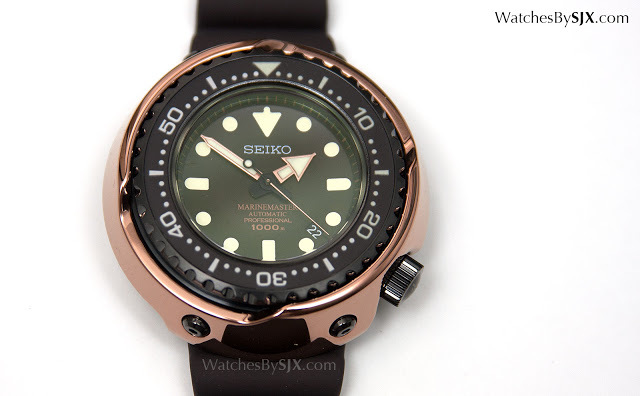 Unlike most Seiko dive watches that have a clear no-nonsense look about them, the Marinemaster Cermet is almost extravagant with its shiny pink gold shroud. 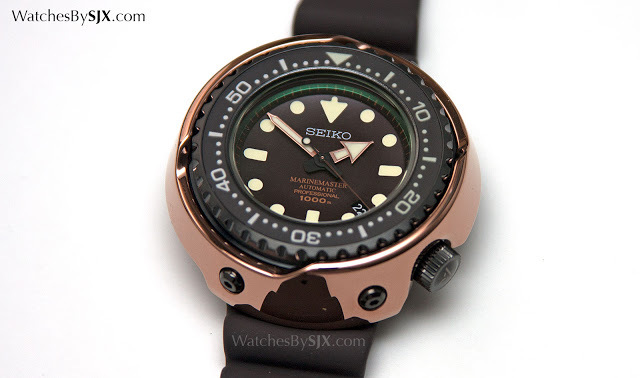 It is probably the coolest looking Seiko dive watch ever. A composite material of ceramic and metal that combines properties of both materials like the hardness of ceramic and the elasticity of metal, Cermet is used for the first time in a Seiko dive watch. The shroud is made by sintering ceramic and metal powder, essentially mixing the powders and heating them in a mould, compacting and fusing them into a hard, dense shape. 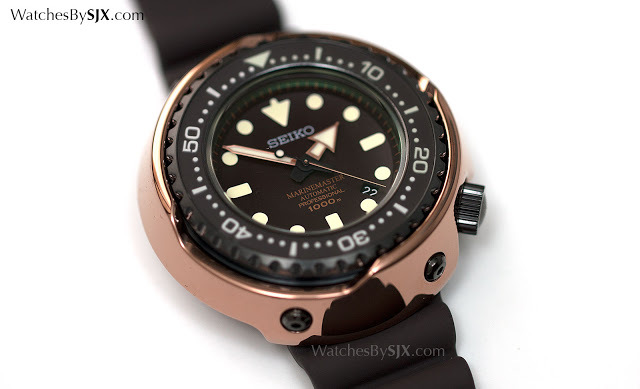 Seiko describes the shroud as pink gold, but it’s far more red than ordinary pink gold, looking more like copper. The entire shroud is mirror polished to a perfect gloss, looking much like metal, something impossible to achieve with a traditional ceramic. The specs of the Marinemaster Cermet are identical to the “Emperor Tuna”, now in its second generation with the new Marinemaster SBDX014. It measures 52.4mm in diameter and 17.2mm high – extremely large but thanks to short lugs hidden under the shroud it sits well even on smaller wrists. 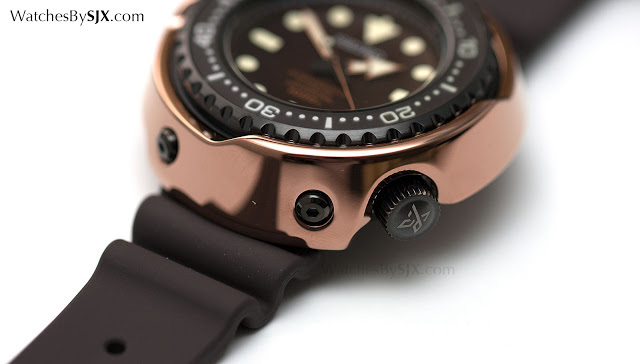 Like the other Marinemaster “Tuna” dive watches, the inner case under the shroud is coated titanium. While the ordinary Marinemaster 1000m has a black coated case and dial, the Cermet limited edition has a dark brown coating on the case, as well as a dark brown dial. Usually the antireflective coating on the crystal has a green tint, instead of the typical blue. The Marinemaster is rated to 1000m, but as a recent test by the Japanese marine research agency (JAMSTEC) proved, the Marinemaster 1000m is capable of withstanding depths of over 4000m, or 2.6 miles. While most saturation diver’s watches have helium escape valves (the Rolex Sea-Dweller is the best known example), the Marinemaster does not need one because of its patented L-shaped gaskets that prevent helium from entering the case. The Marinemaster Cermet is powered by the 8L35, an automatic movement that’s a less decorated version of the Grand Seiko calibre 9S55. It’s a limited edition of 700 pieces, with a retail price of ¥432,000.